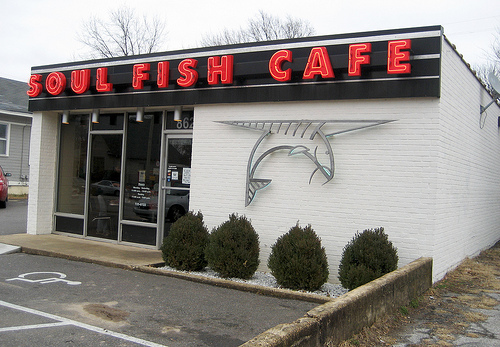 This week on BreAnna’s Restaurant Health card is Soul Fish Café. The restaurant has been open since 2006. The first location is at 862 South Cooper in the heart of Cooper Young. The owners have recently opened another location in Germantown at 3160 Village Shops Drive. The two locations are open Mondays through Saturdays from 11 a.m. to 10 p.m., and Sundays from 11 a.m. to 9 p.m. The menu consists of a variety of soul food options. Choosing to watch your calorie intake can be a difficult task when surrounded by tasteful food. On Saturday, I visited Soul Fish Café to try out an entrée. The food was great and affordable. While there, I spoke to customers who were there eating. Soul food has been known to contain a high number of calories due to the majority of the food being deep-fried or cooked with a lot of oil. One positive side of Soul Fish Café is that they have an array of healthy items on the menu. Customers can choose from the Blackened Tilapia to the Vegetable Plate. Fish Tacos are even considered a healthier choice if the fish is blackened versus fried. Choosing sweet potato fries over regular French fries is another healthy choice. Not all soul food is fattening. It’s all about choosing the healthier methods over the not so healthy choices. If you follow that method, you can eat soul food without worrying about calories. A balanced meal plan equals a balanced life.